Since we can't help but think of summer at least a little bit this time of year, in Maine—this monthly pairing celebrates summer and red stripes—with a timeless 1951 cover of Harper's Bazaar and a summer fun invitation by Ashley Woodman. It comes in blue, too! See our other Monthly Pairings here. A absolutely perfect pairing. 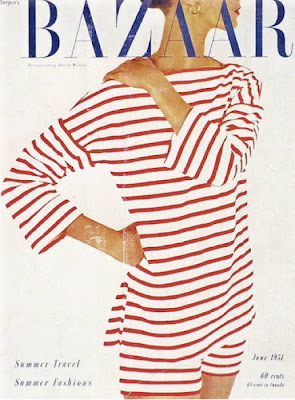 What is it about practically anything nautical that just lifts the spirit? 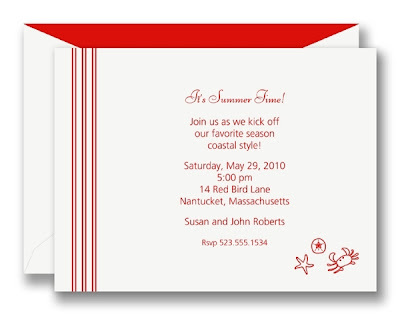 This invitation would be divine for all sorts of beach inspired swaray's.